Drammen is split into two boroughs: Strømsø to the south of the river and Bragernes to the north. The family attended Tangen church in Strømsø, about 4 km directly north of the nearby town of Skoger. The two brothers would stay close and Christen is listed as a sponsor for each of the five children born to Ole. The same goes for Ole as he appeared as a sponsor for each of Christen's children (when listed). JOHANNE MARIA , born 30 Jun 1825 at Gravningen Farm in Sande. SponsorsA: Dorthe Halvorsdatter Donnerrud, Birthe Andersdatter Hertzgården, Ole Johnsen Stokke-eiet, Anders Bertelsen Tangen and Thore Thoresen.17 Johanne was confirmed 1840.18 She has since had the farm Kvisle in Sande added to her name. Christen Johnsen Death (1833)Christen died on 09 Apr 1833 at Orhus farm in Sande at the age of 42.22 All said and done, Christen's crofter lifestyle has documented him as living at 12 separate farms throughout his life... and I'm certain there were more in the many years of his life that were not documented. The above is a modified and expanded translation from the book "Forfedrene Og Vi" by Sigfred L. Eier. Published in Svelvik, Norway in 1942. Sigfred was a freelance writer for the Svelviksposten local newspaper, a local historian for the towns of Svelvik & Strommen, a family historian, and cousin to Christoffer Christoffersen Lowe. Sigfred also established the town museum in Svelvik. Ingebor Olsdatter Schierven, 21 May 1761 - ? Gurine Christensdatter, 16 Dec 1811 – ? Olia Christensdatter, 30 Mar 1817 – ? Johanne Maria Christensdatter, 30 Jun 1825 – ? A Commonly translated as “Godparents” or “Mentors”, sponsors at this time served a similar purpose as they do today, however it was not common to see just 2 names listed. In this case there are 5. B This date is not confirmed by the local parish register. The Church book says she was born 13 NOV 1833 however there is a lot of small writing scribbled in the margins that is illegible to me. C Confirmation was a right of passage for children. Required by the government, a child wasn't supposed to be able to obtain work until they had been confirmed. It's likely that a combination of Christen's constant movement, his relocation by himself, and that Sande is a rural area allowed him to work without being confirmed as long as he did. 1 Norway Parish Registers, Baptism Records about Christen Johnsen; The National Archives of Norway: The Digital Archives; Oslo, Norway; (http://www.arkivverket.no/URN:kb_read?idx_kildeid=8242&idx_id=8242&uid=ny&idx_side=-338); Visited:13 Jan 2014 ; Vestfold county, Lardal, Parish register (official) nr. 3 (1733-1815), Birth and baptism records 1790, page 669-670; Entry No. : 18. 2 Norway Parish Registers, Baptism Records about Ole Johnsen; The National Archives of Norway: The Digital Archives; Oslo, Norway; (http://www.arkivverket.no/URN:kb_read?idx_kildeid=8242&idx_id=8242&uid=ny&idx_side=-347); Visited:13 Jan 2014 ; Vestfold county, Lardal, Parish register (official) nr. 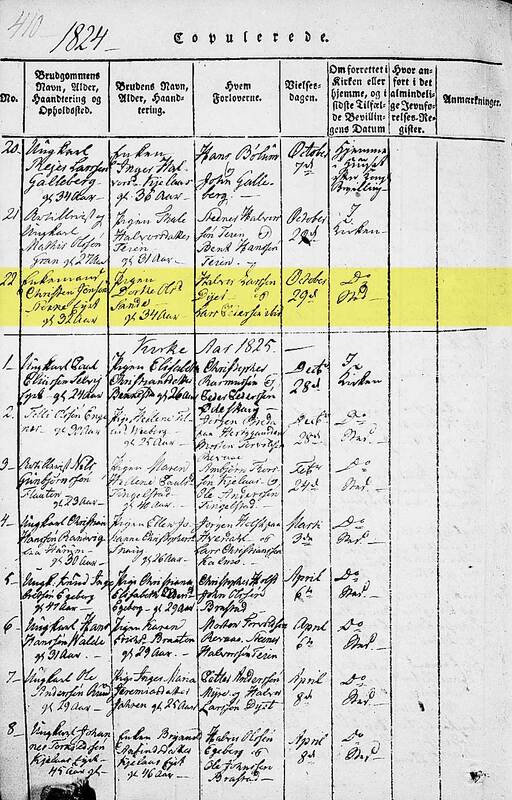 3 (1733-1815), Birth and baptism records 1791, page 687-688; Entry No. : 23. 3 Norway Parish Registers, Baptism Records about Simen Johnsen; The National Archives of Norway: The Digital Archives; Oslo, Norway; (http://www.arkivverket.no/URN:kb_read?idx_kildeid=8242&idx_id=8242&uid=ny&idx_side=-368); Visited:13 Jan 2014 ; Vestfold county, Lardal, Parish register (official) nr. 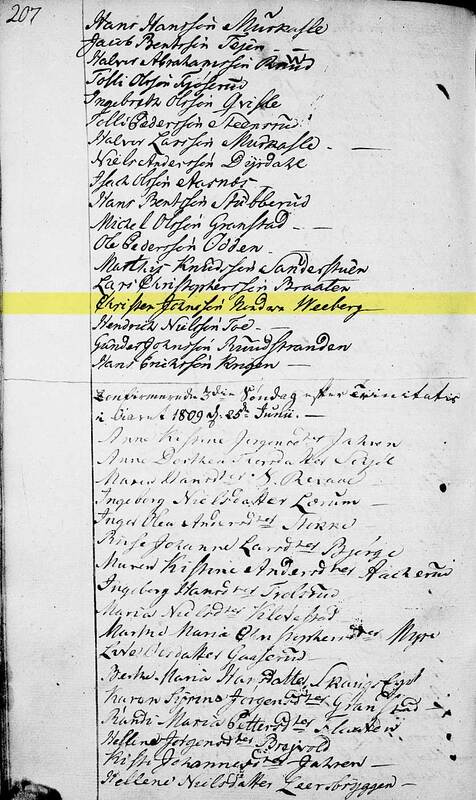 3 (1733-1815), Birth and baptism records 1794, page 729-730; Entry No. : 10. 4 Norway Parish Registers, Baptism Records about Anders Johnsen; The National Archives of Norway: The Digital Archives; Oslo, Norway; (http://www.arkivverket.no/URN:kb_read?idx_kildeid=8473&idx_id=8473&uid=ny&idx_side=-80); Visited:13 Jan 2014 ; Buskerud county, Tangen in Strømsø, Parish register (official) nr. II 2 (1739-1814), Birth and baptism records 1798, page 77. 5 1801 Norway Census about Christen Johnsen; The National Archives of Norway: The Digital Archives (Digitalarkivet); Oslo, Norway; (http://www.digitalarkivet.no/cgi-win/webcens.exe?slag=visbase&sidenr=1&filnamn=f18010712&gardpostnr=138&personpostnr=1235#nedre); Visited:13 Jan 2014 ; Buskerud county, Strømsø, Census of 0712 Strømsøe, Entry No. : 1235-1239; Family No. : 138. 6 Norway Parish Registers, Death & Burial Records about Anders Johnsen; The National Archives of Norway: The Digital Archives; Oslo, Norway; (http://www.arkivverket.no/URN:kb_read?idx_kildeid=8473&idx_id=8473&uid=ny&idx_side=-154); Visited:13 Jan 2014 ; Buskerud county, Tangen in Strømsø, Parish register (official) nr. II 2 (1739-1814), Death and burial records 1800, page 175; Entry No. : 4. 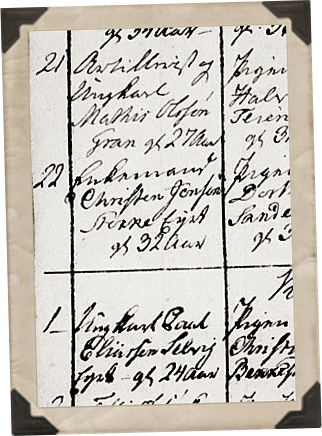 7 Norway Parish Registers, Death & Burial Records about John Andersen; The National Archives of Norway: The Digital Archives; Oslo, Norway; (http://www.arkivverket.no/URN:kb_read?idx_kildeid=8473&idx_id=8473&uid=ny&idx_side=-122); Visited:13 Jan 2014 ; Buskerud county, Tangen in Strømsø, Parish register (official) nr. II 2 (1739-1814), Death and burial records 1803-1804, page 146. 8 Norway Parish Registers, Confirmation Records about Christen Johnsen; The National Archives of Norway: The Digital Archives; Oslo, Norway; (http://www.arkivverket.no/URN:kb_read?idx_kildeid=8127&idx_id=8127&uid=ny&idx_side=-60); Visited:13 Jan 2014 ; Vestfold county, Sande, Parish register (official) nr. 2 (1804-1814), Confirmation records 1809, page 207-208. 9 Norway Parish Registers, Marriage Records about Christen Johnsen & Aase Olsdatter; The National Archives of Norway: The Digital Archives; Oslo, Norway; (http://www.arkivverket.no/URN:kb_read?idx_kildeid=8127&idx_id=8127&uid=ny&idx_side=-68); Visited:13 Jan 2014 ; Vestfold county, Sande, Parish register (official) nr. 3 (1814-1847), Marriage records 1836, page 424-425. 10 Norway Parish Registers, Baptism Records about Gurine Christensdatter; The National Archives of Norway: The Digital Archives; Oslo, Norway; (http://www.arkivverket.no/URN:kb_read?idx_kildeid=8127&idx_id=8127&uid=ny&idx_side=-34); Visited:13 Jan 2014 ; Vestfold county, Sande, Parish register (official) nr. 2 (1804-1814), Birth and baptism records 1812, page 60-61. 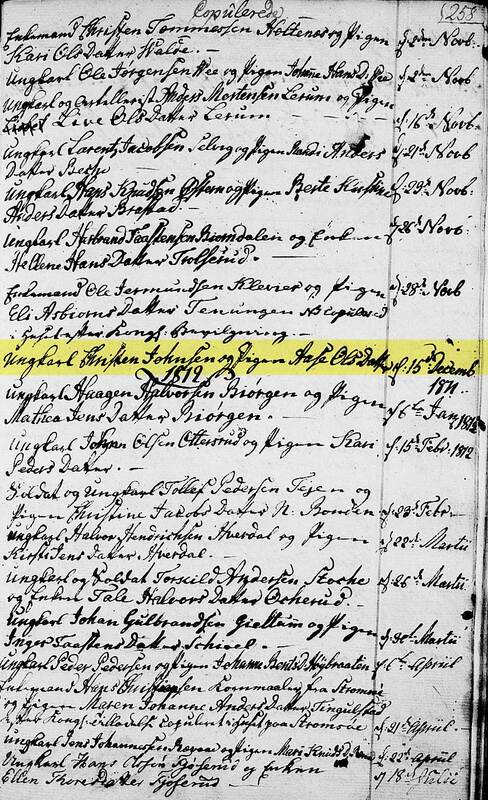 11 Norway Parish Registers, Baptism Records about Ingeborg Christensdatter; The National Archives of Norway: The Digital Archives; Oslo, Norway; (http://www.arkivverket.no/URN:kb_read?idx_kildeid=8127&idx_id=8127&uid=ny&idx_side=-44); Visited:13 Jan 2014 ; Vestfold county, Sande, Parish register (official) nr. 2 (1804-1814), Birth and baptism records 1814, page 80. 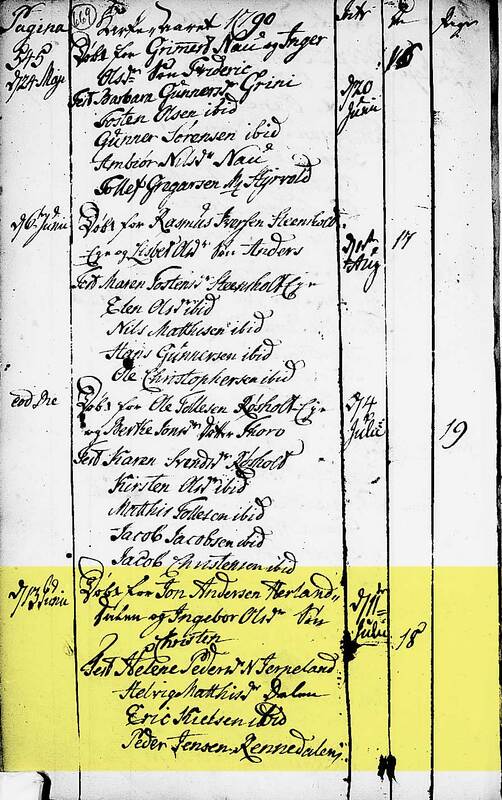 12 Norway Parish Registers, Baptism Records about Olia Christensdatter; The National Archives of Norway: The Digital Archives; Oslo, Norway; (http://www.arkivverket.no/URN:kb_read?idx_kildeid=1264&idx_id=1264&uid=ny&idx_side=-19); Visited:13 Jan 2014 ; Vestfold county, Sande, Parish register (official) nr. 3 (1814-1847), Birth and baptism records 1817, page 30-31; Entry No. : 8. 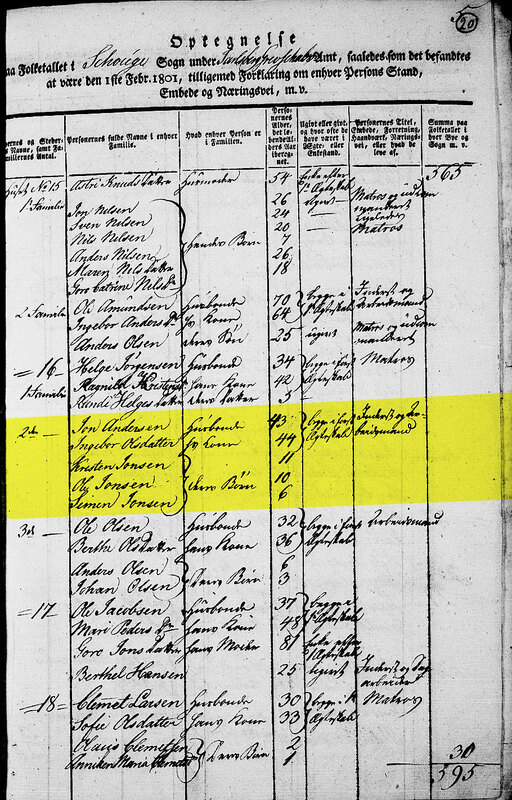 13 1815 Norway Census about Christen Johnsen; The National Archives of Norway: The Digital Archives (Digitalarkivet); Oslo, Norway; (http://digitalarkivet.no/cgi-win/webcens.exe?slag=visbase&sidenr=1&filnamn=Sande1815&gardpostnr=1673&merk=1673#ovre); Visited:13 Jan 2014 ; Vestfold county, Sande, Census of Sande, Entry No. : 1673-1676. 14 Norway Parish Registers, Death & Burial Records about Aase Olsdatter; The National Archives of Norway: The Digital Archives; Oslo, Norway; (http://www.arkivverket.no/URN:kb_read?idx_kildeid=1264&idx_id=1264&uid=ny&idx_side=-111); Visited:13 Jan 2014 ; Vestfold county, Sande, Parish register (official) nr. 3 (1814-1847), Death and burial records 1817, page 198-199; Record No. : 7. 15 Norway Parish Registers, Baptism Records about Olia Christensdatter; The National Archives of Norway: The Digital Archives; Oslo, Norway; (http://www.arkivverket.no/URN:kb_read?idx_kildeid=1264&idx_id=1264&uid=ny&idx_side=-51); Visited:13 Jan 2014 ; Vestfold county, Sande, Parish register (official) nr. 3 (1814-1847), Birth and baptism records 1823, page 92; Entry No. : 24. 16 Norway Parish Registers, Marriage Records about Christen Johnsen & Dorthe Olsdatter; The National Archives of Norway: The Digital Archives; Oslo, Norway; (http://www.arkivverket.no/URN:kb_read?idx_kildeid=8127&idx_id=8127&uid=ny&idx_side=-68); Visited:13 Jan 2014 ; Vestfold county, Sande, Parish register (official) nr. 3 (1814-1847), Marriage records 1836, page 424-425; Record No. : 21. 17 Norway Parish Registers, Baptism Records about Johanne Marie Christensdatter; The National Archives of Norway: The Digital Archives; Oslo, Norway; (http://www.arkivverket.no/URN:kb_read?idx_kildeid=1264&idx_id=1264&uid=ny&idx_side=-62); Visited:13 Jan 2014 ; Vestfold county, Sande, Parish register (official) nr. 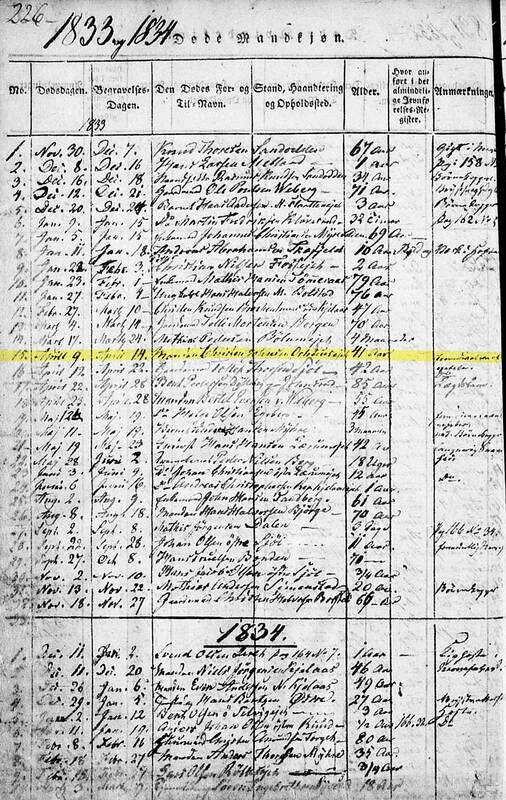 3 (1814-1847), Birth and baptism records 1825, page 114-115; Entry No. : 34. 18 Norway Parish Registers, Confirmation Records about Johanne Marie Christensdatter; The National Archives of Norway: The Digital Archives; Oslo, Norway; (http://www.arkivverket.no/URN:kb_read?idx_kildeid=1264&idx_id=1264&uid=ny&idx_side=-271); Visited:13 Jan 2014 ; Vestfold county, Sande, Parish register (official) nr. 3 (1814-1847), Confirmation records 1840, page 574-575; Entry No. : 17. 19 Norway Parish Registers, Baptism Records about Christopher Christensen; The National Archives of Norway: The Digital Archives; Oslo, Norway; (http://www.arkivverket.no/URN:kb_read?idx_kildeid=1264&idx_id=1264&uid=ny&idx_side=-76); Visited:13 Jan 2014 ; Vestfold county, Sande, Parish register (official) nr. 2 (1804-1814), Marriage records 1811-1812, page 257-258; Entry No. : 27. 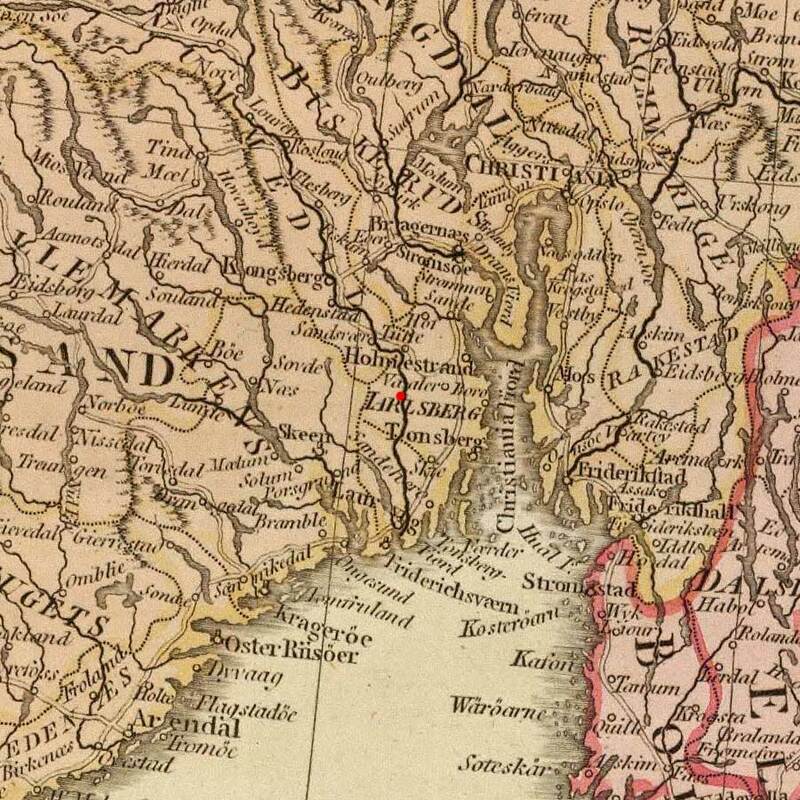 20 Norway Parish Registers, Baptism Records about John Christensen; The National Archives of Norway: The Digital Archives; Oslo, Norway; (http://www.arkivverket.no/URN:kb_read?idx_kildeid=1264&idx_id=1264&uid=ny&idx_side=-81); Visited:13 Jan 2014 ; Vestfold county, Sande, Parish register (official) nr. 3 (1814-1847), Birth and baptism records 1830, page 146-147; Entry No. : 5. 21 Norway Parish Registers, Baptism Records about Karen Olava Christensdatter; The National Archives of Norway: The Digital Archives; Oslo, Norway; (http://www.arkivverket.no/URN:kb_read?idx_kildeid=1264&idx_id=1264&uid=ny&idx_side=-93); Visited:13 Jan 2014 ; Vestfold county, Sande, Parish register (official) nr. 3 (1814-1847), Birth and baptism records 1834, page 168-169; Entry No. : 2. 22 Norway Parish Registers, Death & Burial Records about Christen Johnsen; The National Archives of Norway: The Digital Archives; Oslo, Norway; (http://www.arkivverket.no/URN:kb_read?idx_kildeid=1264&idx_id=1264&uid=ny&idx_side=-193); Visited:13 Jan 2014 ; Vestfold county, Sande, Parish register (official) nr. 3 (1814-1847), Death and burial records 1833-1834, page 226-227; Entry No. : 15. 23 Norway Parish Registers, Marriage Records about Dorthe Olsdatter Orhus; The National Archives of Norway: The Digital Archives; Oslo, Norway; (http://www.arkivverket.no/URN:kb_read?idx_kildeid=1264&idx_id=1264&uid=ny&idx_side=-193); Visited:13 Jan 2014 ; Vestfold county, Sande, Parish register (official) nr. 3 (1814-1847), Marriage records 1836, page 424-425; Entry No. : 3. 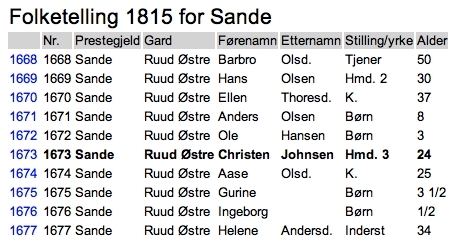 24 Christen Jensen is listed as owning the Qvisle farm in Sande on the 1838 Land Register (Now known by Kvisle). Jarlsberg & Larvik, Jarlsberg, Sande, Sande; House No. : 136; Qvisle; No. : 280b-281. 25 Norway Parish Registers, Death & Burial Records about Dorthe Olsdatter; The National Archives of Norway: The Digital Archives; Oslo, Norway; (http://www.arkivverket.no/URN:kb_read?idx_kildeid=1265&idx_id=1265&uid=ny&idx_side=-298); Visited:13 Jan 2014 ; Vestfold county, Sande, Parish register (official) nr. 4 (1847-1864), Death and burial records women 1851-1852, page 297; Entry No. : 23.